I like to think of fatherly wisdom as a gift, though my delivery clearly needs work. In a recent conversation with my daughter, I passed on the much-used but pithy nugget: ‘don’t put all your eggs in one basket!’ Her look was withering: ‘Eggs?’ Ok, so further explanation was necessary (and equally unsuccessful), but I still hold to the truth of it. I’ve been reflecting lately, inspired by the biography of a notable pastor, on just how important this principle of ‘basket diversity’ is in my own life. 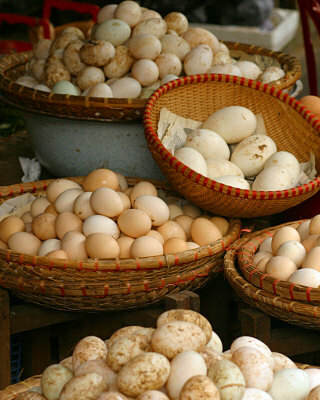 If the ‘eggs’ are my vocation–my sense of self and calling–then where I put those eggs is critical to a thriving and sustainable way of life. There was a time when I thought of vocation in a very limited what-I-do-for-a-living sort of way. For me that was found in my work as a pastor. The trouble with putting all of my vocational eggs in that basket is that my entire sense of self rode the roller coaster of a fickle and fragile business. When ministry went well, I soared. When it faltered and failed, I was in tatters. The truth is, vocation is so much more than our work. It has to do with being made ‘in the image of God’. It’s about identity not activity, who we are not what we do. This much broader sense of vocation finds expression in every aspect of our lives: in our work, our homes and neighbourhoods, our relationships, our interests, our rest and recreation, our spending, our learning and so on. The vocational baskets are multiple. So, what difference does this make for me? Apart from family, there are three dominant activities that take most of my time: I pastor, I cook and I write. While each include elements of necessity, I’ve not been strong-armed into any of them. Each is a choice. Each one is vocational, an expression of who I am as one made in God’s image. These are not just three things that I do, they are each who I am. I don’t do ministry. I am a pastor. The ministry I offer is an overflow of my identity. I don’t write simply as a marginal activity. I am a writer. It’s how I think and feel. And I do not cook purely by necessity or for distraction. I am a cook. In cooking I am me. Each of these three vocational baskets has its rewards, and each, in its own way, is transformational. The rewards of pastoral ministry are the most intangible; its transformations difficult to trace. I can come home from a day at work unable to identify a single achievement. More often I’m aware of regressions, failures and stubborn lines that will not budge, even in the longer term. If the daily trajectory of pastoral success has ever been mapped, I missed the memo. Don’t get me wrong: the transformations of ministry are real, but so very slow and, in my experience, often known only in retrospect. It’s a messy and chaotic business and dependent upon so many factors I cannot control. Pastoring is all about people. Enough said. Writing is a different matter. It, too, is slow and its impact difficult to judge. But it’s contained in a way that ministry is not, and the outcomes are tangible no matter how long in gestation. Even more, the task of writing is mine. It’s me and the screen. It’s the very personal task of finding and manipulating words in a way that is congruent with what I feel and know. If I fail, I fail; If I succeed, I succeed, no one else. And all being well, from time to time I can hold in my hand a product, an object of writing the signals completion. That said, writing is an isolating business. It lets you get away with a degree of solitude and independence that pastoral ministry will never allow. And then there is cooking. Like pastoring and writing for me, cooking is vocational. As a daily activity, it is both rewarding and transforming, but in a much more sensual and immediate way. Its purpose is crystal clear, and once complete the product is eaten and the activity done. Until tomorrow. Success and failure are so easy to judge, and the tasks simple. Cooking has a way of pulling me into the here and now with irresistible force. And its rewards for me and those I cook for need no explanation or justification. Even more, cooking gets me out of my head and into my body in ways pastoring and writing can never do. There are other baskets in my life too, but the point is made. There is more than one and each is a valid means of vocational expression. My baskets are mine. Yours will be different. But hear this: when it comes to the eggs of your vocation, know that you are a person made beautifully and uniquely in God’s image. There is so much more to you and your calling than what you get paid to achieve. So whatever you do, don’t go putting all those eggs in one basket!